With her degree in History and Secondary Education, Jennifer Jenkins had every intention of teaching teens to love George Washington and appreciate the finer points of ancient battle stratagem. (Seriously, she’s obsessed with ancient warfare.) However, life had different plans in store when the writing began. As a proud member of Writers Cubed, and a co-founder of the Teen Author Boot Camp, she feels blessed to be able to fulfill both her ambition to work with teens as well as write Young Adult fiction. 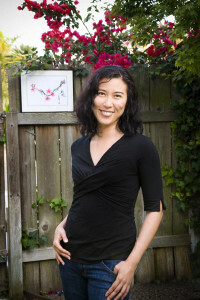 Cindy Pon is the author of Silver Phoenix (Greenwillow, 2009), which was named one of the Top Ten Fantasy and Science Fiction Books for Youth by the American Library Association’s Booklist, and one of 2009′s best Fantasy, Science Fiction and Horror by VOYA. The sequel to Silver Phoenix, titled Fury of the Phoenix, was released in April 2011. Serpentine, the first title in her next Xia duology, will be published by Month9Books in September 2015. She is the co-founder of Diversity in YA with Malinda Lo and on the advisory board of We Need Diverse Books. Cindy is also a Chinese brush painting student of over a decade.